Date palm (Phoenix dactylifera) is probably the most ancient cultivated tree in the world. Even though its ancestry is uncertain, it is believed to originate from Africa. In 1912, it was introduced to North America (Zaid et. al. 2002). Date palms are medium sized (15-25 m tall) and extensively cultivated for the highly nutritious date fruit. 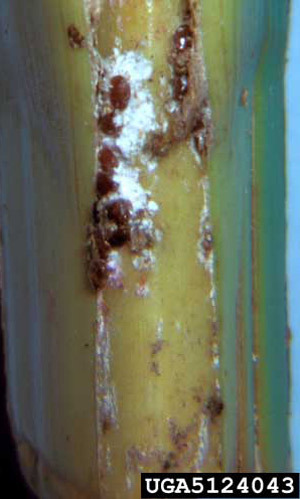 Several diseases and pests attack date palm, and the red date scale, Phoenicococcus marlatti (Cockerell), is one of its most important economic pests. Red date scale is native to North Africa and the Middle East, but it has been found almost everywhere where date palms are grown including Europe, Asia, the Caribbean Region, North America, Central America, and South America (Miller et. al. 2007). Within the United States, it is found in limited distribution in Florida. Populations of date palm scales were intercepted and eradicated in Arizona, California, and Texas (Ferris 1942, Miller and Gimpel 2009, Stickney et.al. 1950). Complete distribution information is available at ScaleNet: A Database of Scale Insects of the World. As with most scale insects, the adult female is the best life stage for field and laboratory identification. Adult females are small, spherical-shaped insects, with a body length size of approximately 0.04 to 0.06 inches (1 to 1.5 mm), and reduced or absent legs. 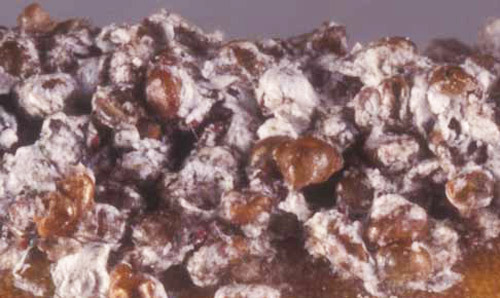 Adult females are a red to reddish-brown color, and may be found embedded in a mass of white cottony wax on plant tissue (Miller et. al. 2007, Avidov and Harpaz 1969, Stickney et.al. 1950). Figure 1. Reddish-brown body of adult female red date scale, Phoenicococcus marlatti (Cockerell). Photograph by Lyle J. Buss, University of Florida. Wax forms around the body and often completely covers it as curly shining white strands. Eggs are smooth, oval, and pinkish in color. Males and 1st instars of both sexes have well-developed eyes, antennae, and legs. Wax is denser on 2nd instar males, but present in enough quantity to completely cover the body for all instars of males and females. Prior to emergence as adults, small, wingless, elongated white cocoons of males may be visible. Figure 2. 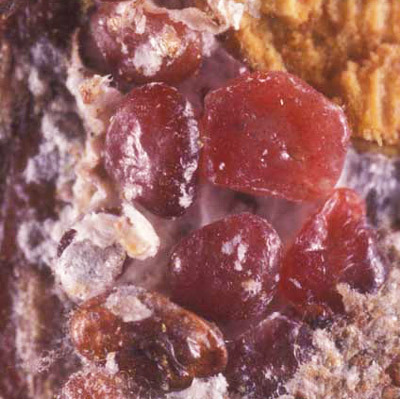 Red date scale, Phoenicococcus marlatti (Cockerell), with white wax surrounding body. Photograph by Lyle J. Buss, University of Florida. Typically four generations per year occur in the U.S., and overlapping generations with all instars present concurrently are possible (Avidov and Harpaz 1969). Development time ranges from 60-158 days, depending upon temperature (Zaid et. al. 2002). Females have three instars or developmental stages. Males have five instars, with the final development stage appearing as a white cocoon (Stickney et.al. 1950). Some eggs hatch within the female, resulting in live birth (i.e. viviparous reproduction) of scale crawlers. The remaining eggs are laid external to the body (Avidov and Harpaz 1969). After the eggs hatch or crawlers emerge from the female's body, the immature or 'crawlers' actively move and freely feed by inserting their need-like mouthparts into the host plant. Once feeding begins, layers of white wax are secreted and cover their body. Soon after females molt, males, which are incapable of feeding, will mate with them and die. Once the females are fertilized, development and egg production occurs quickly (Zaid et. al. 2002). The host for red date scale is usually restricted to palms (family Arecaceae) of the genus Phoenix and it is named after its preferred host, the date palm, Phoenix dactylifera. Washingtonia filifera: California fan palm, Washington palm, American cotton palm, desert fan palm. Additionally, red date scale has been reported from Eucalyptus sp. (family Myrtaceae) (Kozár and Drozdják 1998). Red date scale usually establish at the base of fronds near the trunk or leaf midribs and fruit stalks. Host plant leaves, stems, trunk, fruits, and as well as exposed and underground roots may also be infested. Extensive damage may occur and not be detected until pruning occurs. Figure 3. Adult red date scale, Phoenicococcus marlatti (Cockerell) on Senegal date palm, Phoenix reclinata Jacq. Photograph by Raymond Gill, California Department of Food and Agriculture, www.insectimages.org. Figure 4. Adult red date scale, Phoenicococcus marlatti (Cockerell) on Phoenix spp. Photograph by Raymond Gill, California Department of Food and Agriculture, www.insectimages.org. Premature leaf aging, drying of the fruit, disruption of normal plant metabolic functions, and even plant death may result from heavy infestations (Zaid et. al. 2002). Figure 5. Heavy infestation of red date scale, Phoenicococcus marlatti (Cockerell). Photograph by Lyle J. Buss, University of Florida. 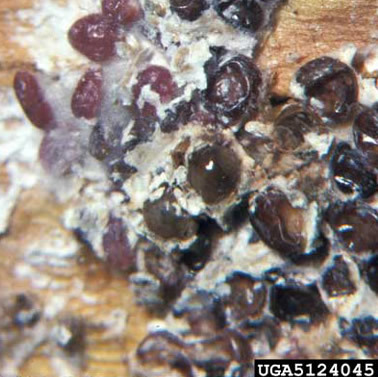 Management of scale insects begins with detection and identification of the pest. Scale insects can be very small or resemble disease organisms or even plant structures, making detection difficult. Regular monitoring will allow early detection of these pests before damage is obvious and will also allow improved control. All plant parts need to be searched, including the undersides of leaves, stems, and roots. Inspection of plants prior to introducing them into the landscape, nursery or collection is very important in reducing new infestations of scales. A brisk wash spray of water can also be helpful in removing scales and reducing populations. Exposure of host roots to moist heat and hot water has been reported as a possible treatment (Stickney et.al. 1950). Scale insects are commonly attacked by predators, parasites and diseases which can help manage scale populations particularly for long term control. It is important to recognize the presence of beneficial insects and to take steps to conserve them in the environment so they are available to control the pest insects. The Acari family Eupodidae; Laemonphloeus sp. (family Laemophloeidae, superfamily Cucujoidea); Cybocephalus californicus (family Nitidulidae), and the Coccinellids Chilocorus sp. and Pharoscymnus anchorago (Fairmaire), are reported predators of red date scale (Miller and Gimpel 2009, Stickney et. al. 1950, Zaid et. al. 2002). It is often necessary to manage scale insects with insecticides so it is important to select appropriate insecticides, timing and application methods to reduce any negative impact on the natural enemies but still get maximum control. Contact insecticides commonly provide quick knockdown of the pest but require good coverage and generally repeat applications. The stage most susceptible to contact insecticides is the crawler stage. Horticultural oil and insecticidal soaps also can provide good control, but must be treated like contact insecticides, which require thorough coverage and repeat applications. Systemic insecticides can provide excellent options for scale control and can provide some flexibility in application timing and methods. These insecticides move through the plant and provide an excellent way to expose scale insects to the insecticide when they feed on the plant. It is important not to overuse or misuse insecticides which can lead to numerous problems including insecticide resistance. To avoid insecticide resistance, it is critical to rotate among insecticide groups. Abou-Elkhair S. 2001. 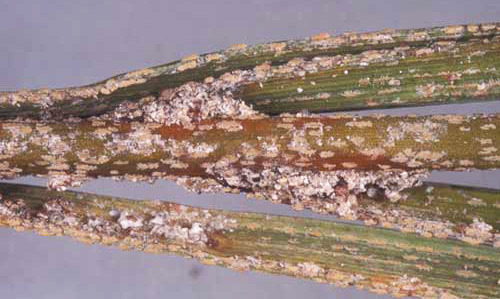 Scale insects (Hemiptera: Coccidae) and their parasitoids on ornamental plants in Alexandria, Egypt. Entomologica 33: 185-195. Avidov Z, Harpaz I. 1969. Plant Pests of Israel. Israel Univ. Press, Jerusalem. 549 pp. Ferris GF. 1942. Atlas of the Scale Insects of North America. Series 4. Stanford University Press, Palo Alto, California. 253 pp. Kozár F, Drozdják J. 1998. Phoenicococcidae. In Catalogue of Palaearctic Coccoidea. Kozár F (ed). Plant Protection Institute, Hungarian Academy of Sciences, Budapest, Hugary. 526 pp. Miller DR, Rung A, Venable GL, Gill RJ. (August 2007). Scale Insects: Identification tools, images, and diagnostic information for species of quarantine significance CD-ROM. Systematic Entomology Laboratory USDA-ARS. Nixon RW, Carpenter RT. 1978. Growing Dates in the United States. U.S. Department of Agriculture, Agricultural Information Bulletin No. 207. USDA Technical Document. 63 pp. Sinacori A. 1995. Phoenicoccus marlatti (Cockerell) (Homoptera: Phoenicoccidae) in Sicilia. Phytophaga (Palermo) 6: 55-61. Stickney FS, Barnes DW, Simmons P. 1950. Date palm insects in the United States. United States Department of Agriculture Circular 846. 57 pp. Zaid A, de Wet PF, Djerbi M, Oihabi A. 2002. Diseases and pests of date palms. In Date Palm Cultivation. Zaid A (ed). FAO. Rome-Italy. Publication Date: May 2009. Latest revision: March 2011. Reviewed: January 2019.